Seeing a mess around the house at all times can be VERY frustrating, especially if you like things neat and tidy. An overflowing desk, bookshelf and drawer, a stuffed dresser, messy floors, unevenly piled magazines and paper pieces are certainly a time consuming problem. Until now.. These storage baskets allows you to have a designated spot to neatly store a dinosaur, a dragon, towels, crafts, clothing, toys, pet or baby essentials. These organizers will make your place look more spacious. Sick of wasting time looking for things? Your boy or girl will love to use these boxes themselves allowing yourself to feel more relaxed. If at some stage you don't need your organiser containers, you can easily collapse them flat and put them away. Rushing with the cleaning of playrooms when friends and family are coming over? Love that these toyboxes are stackable, lightweight and super easy to "whisk away" to the basement. Enjoy your guests instead of picking up items and finding a place to put them. With sides and base reinforced by cardboard, these solid chests stand at attention even when empty. Not to mention they blend well with your elegant living room decor and furniture. Given that there are no sharp edges, your kids won't get hurt. The bins can teach color identification as well as sorting and cognitive skills. 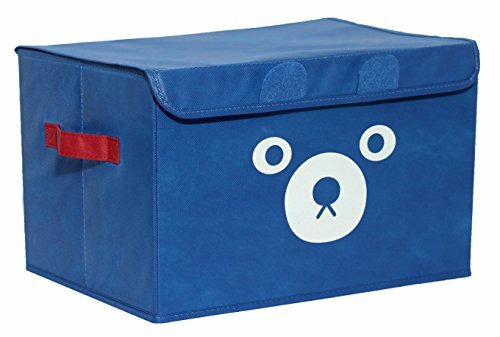 Large enough to hold whatever you throw in it, this toybox adds a pop of fun to every room. Order Today, take the next step towards a more beautiful and organised home and if for any reason you are not satisfied you are backed by our 100% Satisfaction Guarantee and will receive a full refund, no questions asked. If you have any questions about this product by Katabird, contact us by completing and submitting the form below. If you are looking for a specif part number, please include it with your message.